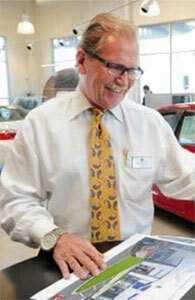 What is Hyundai Blue Link®? The 2017 Hyundai Elantra has wowed drivers near Lockwood and Billings with its available advanced comfort, convenience, and technology features. The completely redesigned 2017 Hyundai Elantra improves on past models and looks to the future. Let’s take a closer look now at some of the available features on the 2017 Hyundai Elantra. Blue Link: Use your smartphone, smartwatch, a web application, or the in-car system to locate points of interest, gas stations, or call for help. It can send an automatic collision notification and request assistance in the event of an accident. Secure your car or start it remotely. Smart Cruise Control: Automatically adjusts speed when slower vehicles are detected in front of your Elantra. Rearview Camera: Gives you added visibility when navigating out of tight spots. Dual USB Inputs: Keep multiple devices moving on the go! Premium Displays: Driver information displays consist of an available 3.5-inch monochromatic LCD display and a color 4.2-inch LCD-TFT display. 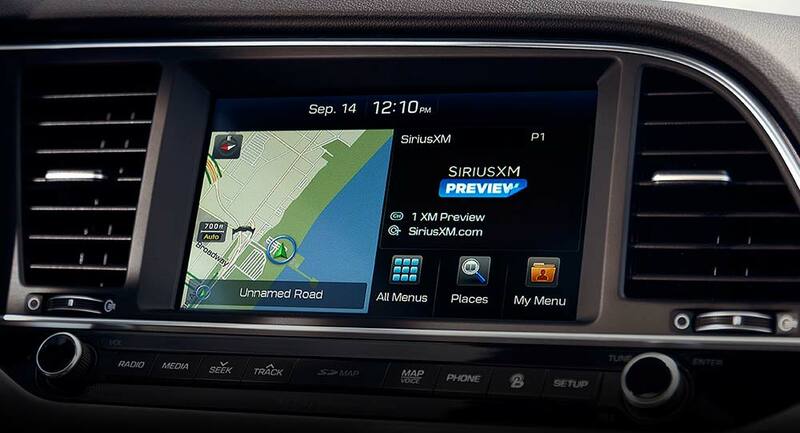 Touchscreen Displays: Choose from a 7-inch touchscreen audio system or an 8-inch touchscreen with navigation options. 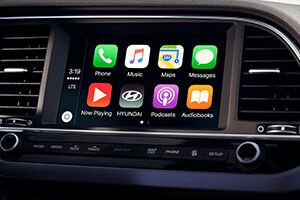 Mobile Syncing: Connect your mobile phone through Apple CarPlay or Android Auto to take advantage of app syncing, voice recognition, hands-free calling, and navigation. Enhanced Audio: 8 speakers and the available Infinity Premium Audio with Clari-Fi Music Restoration Technology offers high fidelity audio enjoyment. Space and Cargo Volume: With generous head and leg room, the Hyundai Elantra offers more space than other vehicles in the segment. While being a compact sedan, the EPA has classified the vehicle as a midsize due to its ample interior space. Power Driver Seat with Memory: Easily adjust the seat to your preferred comfort and save settings for up to two drivers. Dual-Zone Temperature Control: The automatic temperature control system makes dealing with any climate a breeze. The CleanAir Ionizer and Auto Defogging System help you breathe easy in any conditions. Heated Front and Rear Seats: Cooler climates are no match for these heated seats that warm up the interior quickly and comfortably. Lockwood drivers can take a look at the feature-packed 2017 Hyundai Elantra at Underriner Hyundai in Billings, MT by calling 406.255.2365 or sending us a message online.